An audience of exactly 64–we counted–packed tight in a dark room. Two glasses of water and a vial of “poison” on a glass-topped table. One actor, who had never seen the script before it was handed to him onstage by an audience member. And one playwright, thousands of miles away but still present, authoritative and sometimes clairvoyant. Written by Iranian writer Nassim Soleimanpour and first performed in 2011, “White Rabbit Red Rabbit” has been translated into several languages and performed by well-known actors in front of receptive international audiences. However, due to his refusal to complete mandatory military service, Soleimanpour was initially denied a passport and didn’t see his own play until 2013, when due to a medical exemption, he was able to obtain a passport and see his play in London. 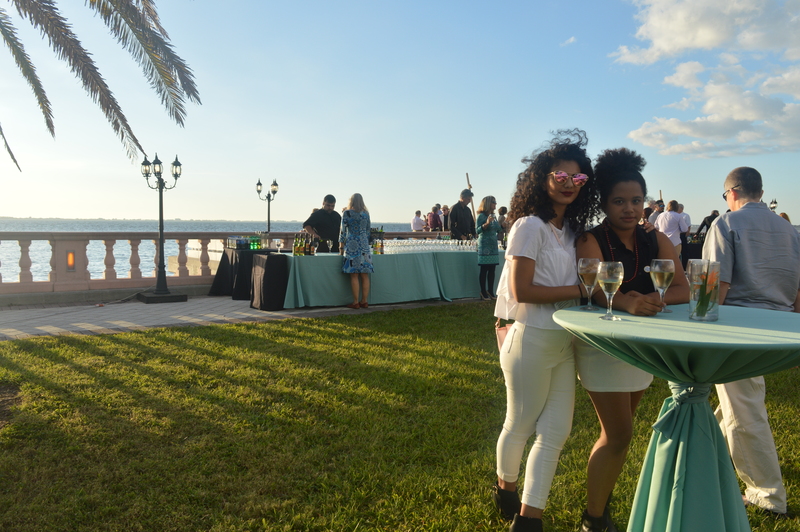 Presented by Ringling International Arts Festival (RIAF) and Urbanite Theatre, located in downtown Sarasota, the play includes a diverse cast of actors and is performed by a different one each night, with no repeat performances, no director, no rehearsals and no reading of the script beforehand. When the actor of the night steps on stage, an audience member hands them an envelope which contains the play. In a phone interview, Summer Dawn Wallace, co-artistic director of Urbanite Theatre and performer in one of the RIAF White Rabbit Red Rabbit shows, discussed what she could without spoiling the experience for the uninitiated. Up for the challenge at Urbanite on Wednesday, Nov. 8, was J. Elijah Cho, who flew from Los Angeles to Tampa for the show. In a phone interview, Cho explained how he heard about the role. Even for someone who enjoys cold readings, there was still some anxiety. 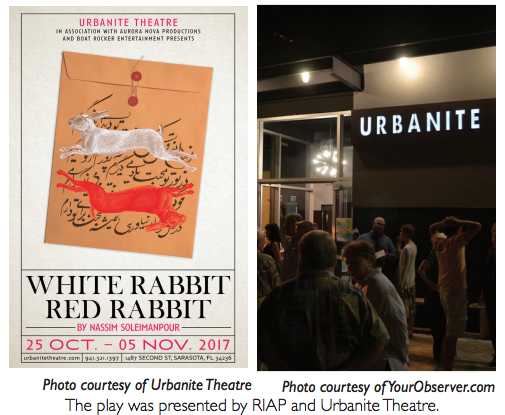 “White Rabbit Red Rabbit” blurs the line between actor and spectator, playing with themes of temporality, restriction and obedience. Within the opening page, the writer asserts his metafictive presence over the lone actor and audience, developing a powerful, persuasive voice. At the writer’s request, the audience counts off one by one, starting with the front row. Sixty-four of us sit in darkened seats, nearly filling the theatre. Then, as one might have anticipated for a play that requested audience participation before it even started, the script calls a particular audience member to aid Cho in his narration. Number three stands up, a dark-haired girl in a green sweater. Onstage, she begins to imitate a rabbit, wrinkling her nose and hopping around. From my front row seat, I admire her ability to thrive when thrust into an unexpected environment. What next? The script demands a bear. Audience member number nine is called to the stage, and this time, it’s me. Yours truly, the reporter. Onstage, number three and I impersonate the white rabbit and the bear respectively. The story progresses with Cho’s narration and shenanigans escalate until we and Cho are hopping around the stage imitating bears imitating rabbits imitating cheetahs imitating ostriches. This is one humorous moment among many, serving to both lighten and illuminate, as the piece touches on darker themes of restriction and control. The audience and actor fall into traps laid by Soleimanpour, be it tricks of probability or psychology, and find themselves along a decided path by the writer. Here, words on a page have power. “White Rabbit Red Rabbit” reorganizes the often strict divisions between artist and spectator, playing with theatrical form in a way that supports the theme and amuses viewers. At the same time, it closes the space between a once-immobilized playwright and the world. The work may be about time, obedience, censorship or the power of words, using mixed metaphors to achieve a complicated end. “At a point [Soleimanpour] refers to the piece as a gun…” Cho said. “Kind of like creating something that you’re not sure what it’s going to do, and to me, I think that to me that’s a very interesting concept because I think that words carry and we’re seeing the impact of free speech right now in the United States and of being open to hearing all sorts of trains of thought and ideologies. If more people were to think of the things they say as a gun I think that maybe there would be more responsibility. Information for this story was gathered from www.bbc.com and www.urbanitetheatre.com. For $5 student tickets and more information about theatrical opportunities, visit www.urbanitetheatre.com.